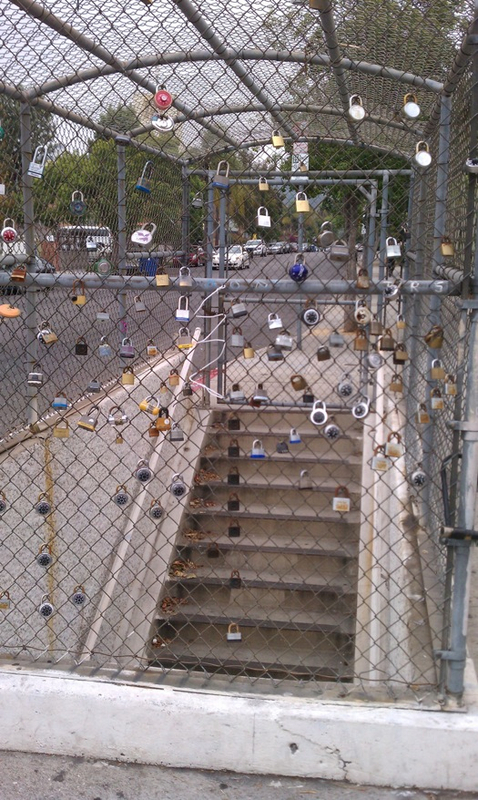 Here’s a pic of a phenomenon I’m curious about: why are all these locks attached to the closed pedestrian underpass? The photo was taken at Hollywood Boulevard at New Hampshire Avenue. If you can explain, please leave a comment. I’m guessing it’s just one of those things I’m too old and un-hip to know about (there are many of these type of things). They’re most likely locks of love. You’re supposed to lock it to the fence, gate, etc. and throw away the key. Voila, ever-lasting love. The first time I saw it was on the Ponte Milvio bridge in Rome. It seemed a little bit morbid before I knew exactly what it was. It is weird. Someone’s trying to make a statement with all those padlocks. Still weird on my weird-o-meter. Great pic btw. Some of the locks seem to make a pattern. –There are 7 dark key padlocks, almost in a vertical line, starting at the top of the stairs, one for each stair,as if they are going up and down the stairs. –Four combo locks in a diamond pattern to the left. –Three vertical combo locks, tracking a vertical rust stain on the stairwell wall. –Were these patterns made by a serial lover, who brings each new conquest to the gate with a new lock– each love never suspecting that he or she will be dumped for a new one, their fleeting love forming love part of the unfolding pattern?